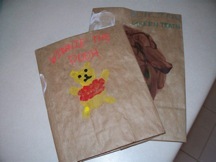 Make a Waterproof Brown Paper Bag Book Cover with NIKWAX! Nikwax can be for more than just your outdoor gear. We have a fun and creative idea for you to try at home using one of our most popular products, TX.Direct! Cut along one of the seams of the bag until you reach the rectangular bottom of the bag; then cut the entire rectangular bottom out of the bag. Lay the bag out flat on the table, with the inside of the bag facing up. Place your book in the middle of the bag so it is centered. The bag should be a lot wider than the book but only a couple of inches taller. 4. Open the book. Draw a line across the bag at the top and bottom of the book. Remove the book. You will have one line across the top of the bag a couple of inches from the top and another across the bottom of the bag. 5. Fold the paper bag down on the top line and up on the bottom line. Your paper bag should be the exact height of the book, but still much wider. 6. Place the book back in the center of the bag and open it up again. Draw a vertical line on the bag to mark the right and left edges of the book. Remove the book and fold the bag on those lines. 7. Time to decorate your bag to your hearts content! Be creative and have fun. Allow your paper bag book covers proper time to dry prior to waterproofing. 8. While Nikwax products are biodegradable and environmentally friendly, we waterproofed outside so that we didn’t make a mess inside. Lay your paper bag book covers on the patio or on newspapers and open your bottle of Nikwax TX.Direct. The spray on works best for this project. Take a paintbrush and coat even strokes of the liquid all over the entire paper bag book cover, including the insides and the folds. Allow the covers proper time to dry and water will bead up on them instead of soaking into the paper! 9. Once your cover is dry, slide the front hard cover of the book into the folded left pocket, and tape it closed. Do not tape it to the book itself. Instead, tape it on the top and bottom of the folded part. Do the same with the back cover of the book. Voila! You now have personalized, waterproof book covers! Categories: Gear Care, Stories | Tags: Art, Book cover, diy book cover, nikwax tx direct, Paper bag, paper bag book cover, waterproof book cover | Permalink.